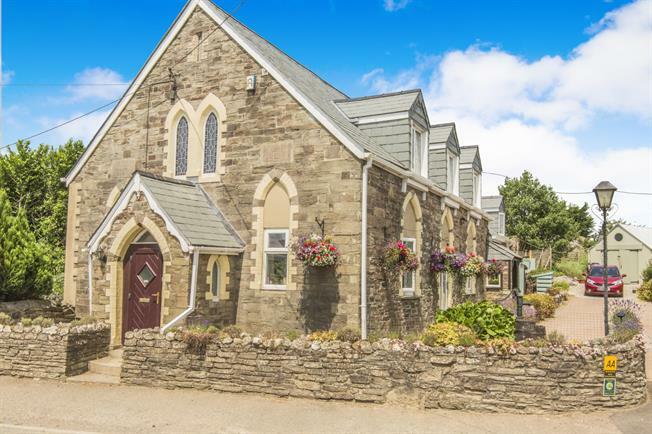 5 Bedroom Detached House For Sale in Lostwithiel for Offers in the region of £425,000. summer house and a garage. Offered to the market chain free. Agents Note - The property is now vacant and unfurnished. Access to the kitchen/diner, living room and dining room. Stairs rising to the first floor with storage underneath. Fitted wall and base units with roll top work surfaces and an inset sink and under unit lighting. Space for free standing fridge, freezer and double oven/range. Roll top work surfaces with space under. Plumbing for two washing machines and a dishwasher. Space for tumble dryer and location for Worcester Bosch boiler. Generous living room with space for dining table. Feature fireplace with 8kw multi fuel burner. Built in shelving in alcoves. Door leading to the outside. Walk in spacious shower, low level WC and pedestal wash hand basin and heated towel rail. Access to four bedrooms and the bathroom. Storage cupboard and loft access. Double bedroom with built in wardrobe and en suite. Walk in shower cubicle, low level WC and wash hand basin. Heated towel rail. Double bedroom with en suite and built in wardrobes. Seating area space with two windows with stained glass surround. Previously the old bell tower. Panelled bath with overhead shower, low level WC and wash hand basin. Decorative block paved parking area for several cars. Well maintained garden with various plants and shrubs on the borders. Path leading to the summerhouse which is insulated and has light and power. Vegetable plot and pond. The property is now unfurnished.